Depicting Leopold 11, King of Belgium with the reverse being the Royal Arms of Belgium. There were two types of these coins – the first being 1867 to 1870 and the second from 1870 to 1882. 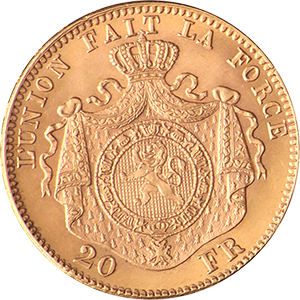 The 20 Belgian Franc coin has its origins in the Napoleonic conquest of much of Western Europe, with the Franc first replacing the Kronenthaler at the turn of the 18th century. Although this was superseded by the Dutch Guilder, the Belgian Franc again became the currency of the region when it started producing cupronickel coins in 1832. 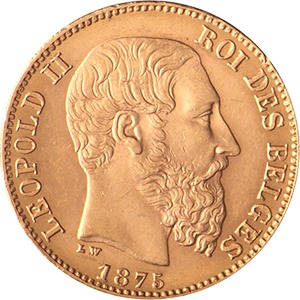 The 20 Belgian Franc coin from the Leopold II era (1909) is arguably the most widespread of all historic Belgian coins and it is also one of the most popular. They can have both Flemish and French inscriptions, but otherwise the coins are identical for each production. Leopold II is one of the most popular monarchs for his era and was known as the “Builder King” due to the many buildings constructed under his reign in the country’s major cities. The design of the 20 Belgian Franc coin during his reign depicts the monarch facing to the right with the words “Roi Des Belges” and the king’s name inscribed around it. On the coin’s reverse is the Belgian crown of arms, in the centre of which is a lion and the inscription “Dieu Protégé La Belgique” – God protects Belgium. The coin has a diameter of 21.40mm and a thickness of 1.30mm. The gold content of the coin weighs 5.81g and the coin is 90% pure, making it one of the purest coins of its era. As with any gold product, historic or otherwise, it is important to ensure that it comes from a reputable source as forgeries are always a risk. Goldinvestments.co.uk has many decades experience in the field, including online sales. We are also happy to provide advice for any precious metal investment from our office in the heart of Central London.